This is the fiberglass under the attic floor that is leaching out and becoming airborne in the house. There are wires and ductwork that run through this floor, down the walls to the second and first floors and to the basement. The house gets a layer of gray dust all over everything. 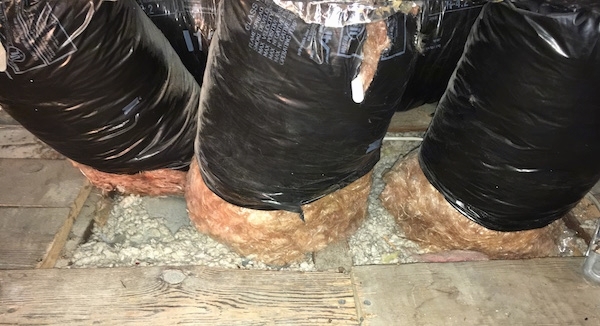 This insulation below the floor needs to be removed. To get to it the floor boards have to be taken up. 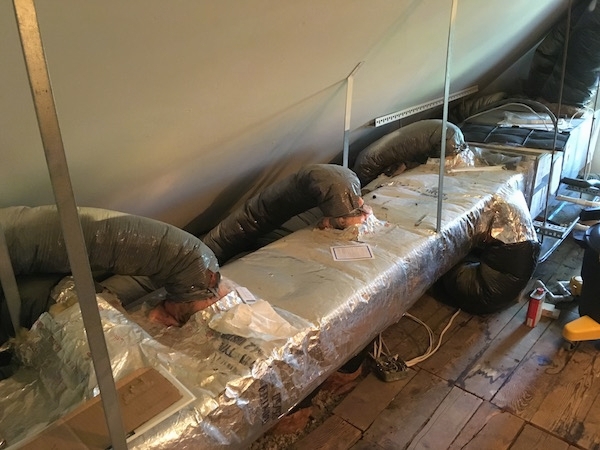 We have to be careful not to disturb the wires within the insulation or push too hard on the lath bottom or the plaster ceiling could get a hole in it on the second floor ceiling. What a mess that would be. 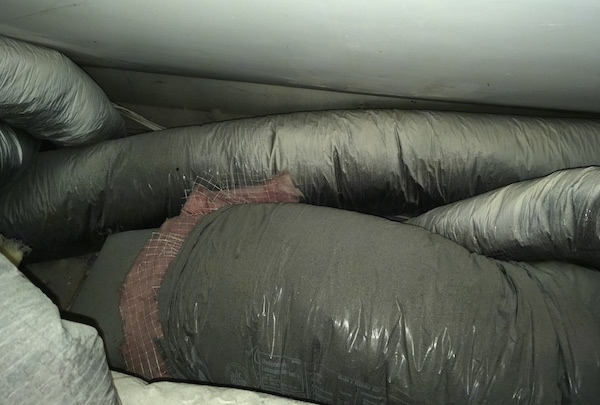 These are flex ducts from a central air unit up in the attic. The ducts go into the floor where they are attached to more ductwork that feeds the second floor. Notice the exposed insulation at the base of them, along with the gray blown in loose fiberglass placed around them. 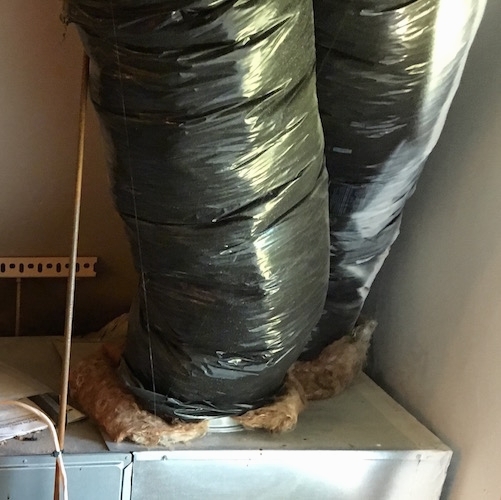 This central air system pulls air from this attic, cools it and blows it out on the second floor. It baffles my mind that people do not consider the air quality when installing these units. I too am guilty of this. It never occurred to me before that fiberglass can be airborne, or that it was even something to worry about. Now that I know my problems were not dust mites but fiberglass, it has become a big 'duh' moment. I could never spend time in this attic. It was not dust mites, but fiberglass dust. 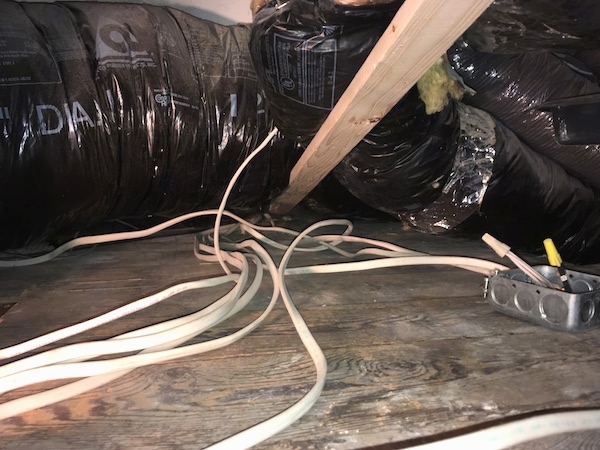 Flex ducts with more exposed fiberglass insulation in the attic. 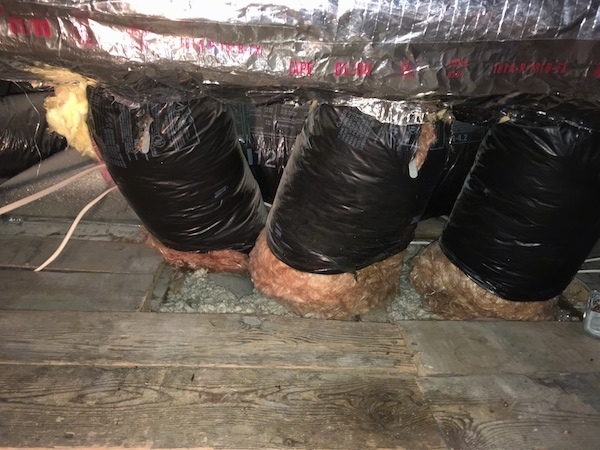 The HVAC installers never thought to tape up that exposed insulation. Large flex ducts going into the central air system. 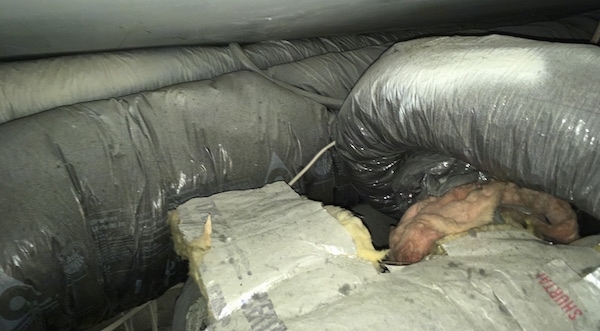 Notice the exposed fiberglass at the base of the ducts. 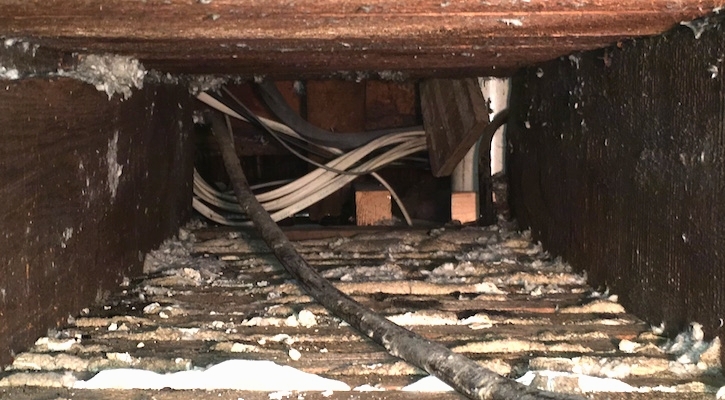 Wires running into the floor down into the blown in fiberglass. 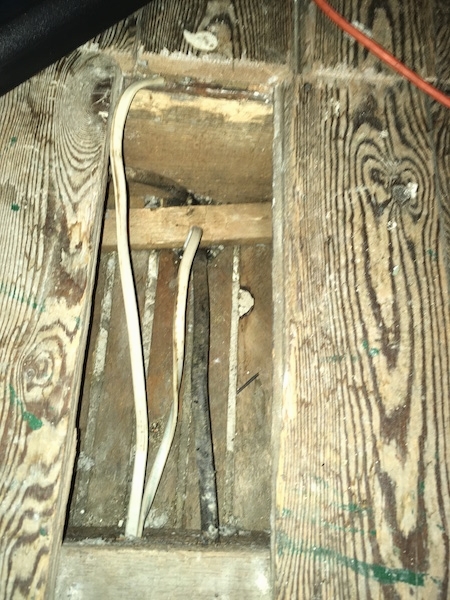 An example of where insulation would leach out, a wire that was run from the attic coming out of a closet to a light. 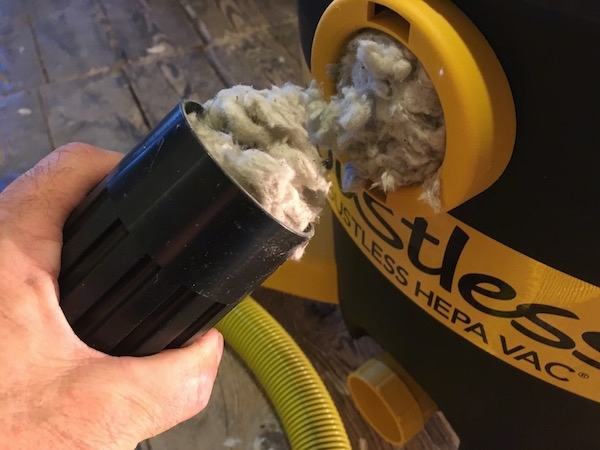 We bought an asbestos certified, HEPA dustless shop vac to remove the insulation along with asbestos dust masks. 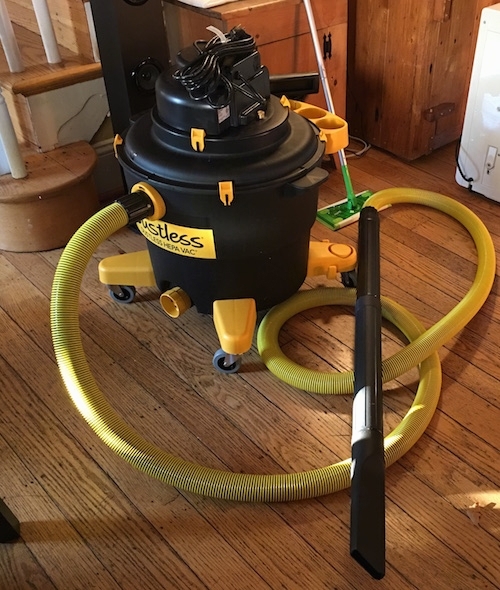 The vac fills up the bags quickly and clogs easily, but is easy to unclog and is getting the job done. 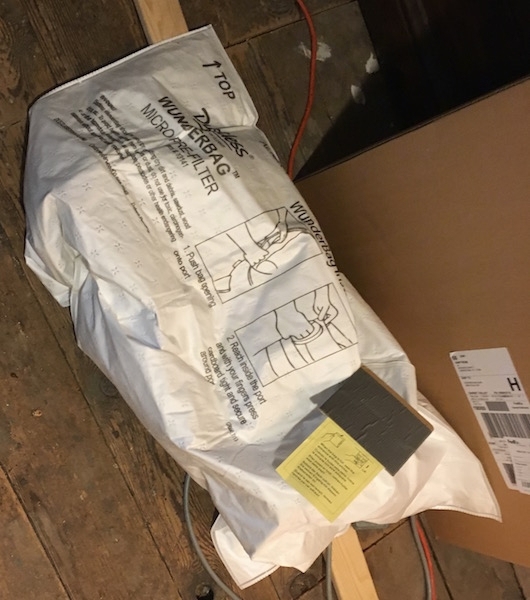 A bag full of blown in fiberglass. When it is full there is a sticker that goes over the opening of the bag to keep the dust from getting back out. The amount of the stuff under the floor is rather overwhelming. We are going to need aproxamently 200 vacuum bags to get the job done. 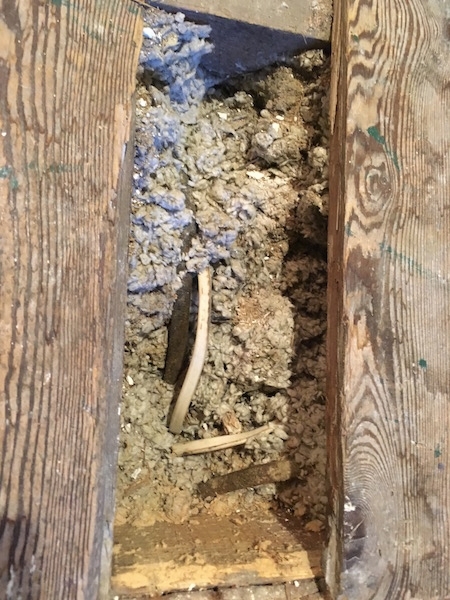 An empty floor cavity after the blown in fiberglass insulation was removed. 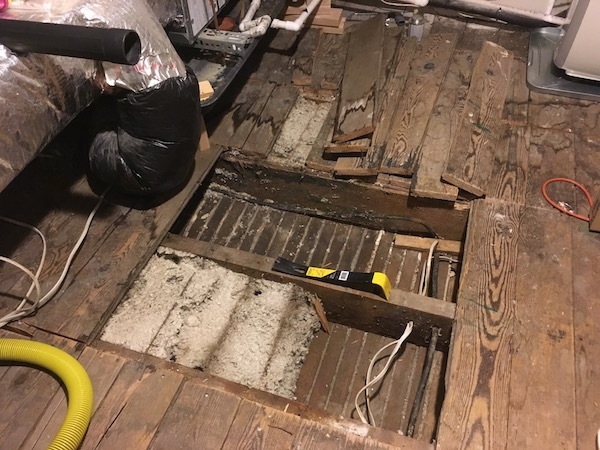 The floor boards need to be removed, the loose fiberglass vacuumed out and the boards nailed back in place. Inside of the floor cavity with some of the fiberglass insulation removed. 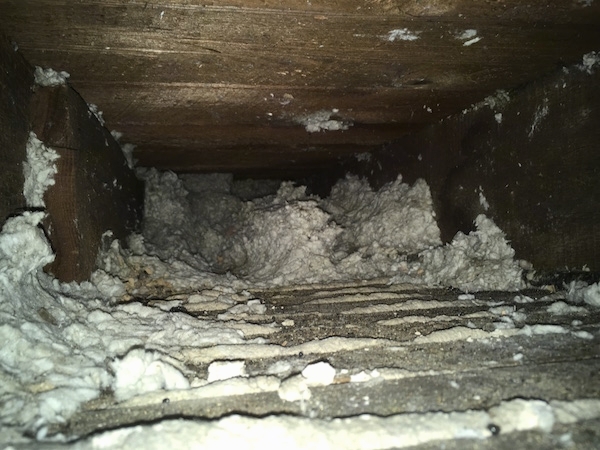 This shows a view of one of the places the glass fibers are getting to the lower levels of the home. 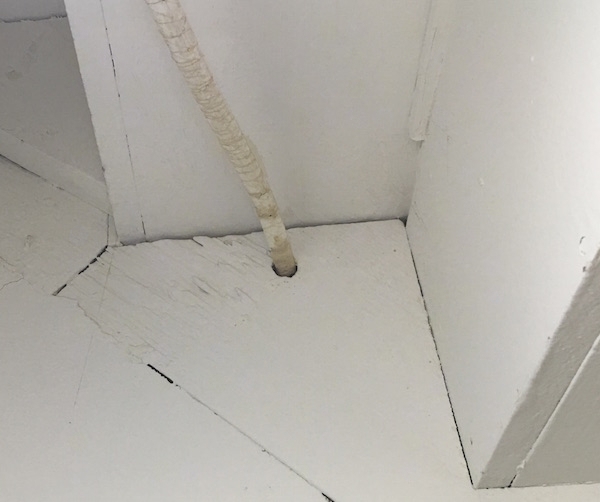 It is escaping along the path of the wires down to the lower levels, out any crack or hole it can find such as a light socket, electric outlet or wall switch. We are not yet sure how it was getting into the vents themselves, but the gray dust showed itself when I taped them over with clear packing tape. 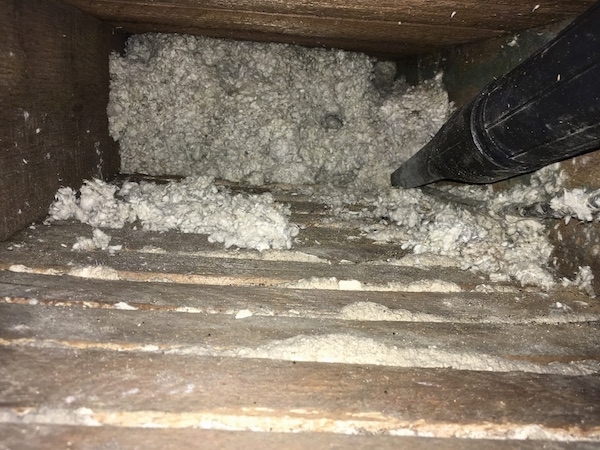 There is also a bathroom vent pipe that runs from both bathrooms below, one on each floor up through that insulation up to the roof where the gray fiberglass material is falling down contaminating both bathrooms. It explains all of the gray dust in the home. 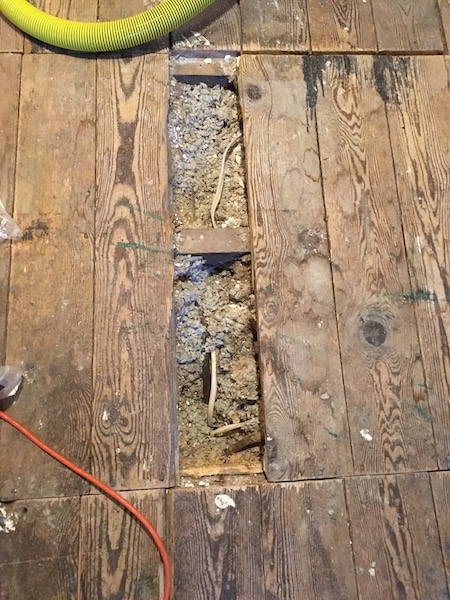 The problem became very apparent after we had a water leak in the third floor attic that dripped down through the second floor ceiling. When fiberglass gets wet it accelerates the break down process, out gases and shatters. 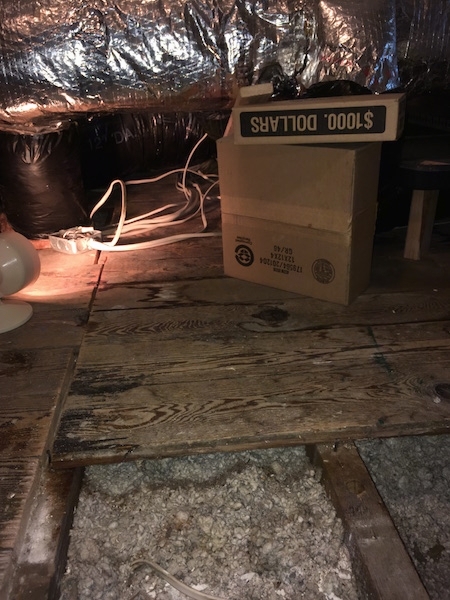 We have always had the gray dust in the house, but it was not until the water damage happened that my lungs pitched a total fit, enough to realize something was seriously wrong with the indoor air quality and that it was not just dust mites.